There are more than 6.8 million households in the United States with investable assets greater than $1 million. Sure we all want to join their ranks, but how confident are Americans they can do it? What do you think the likelihood is you'll be joining the millionaires' club? 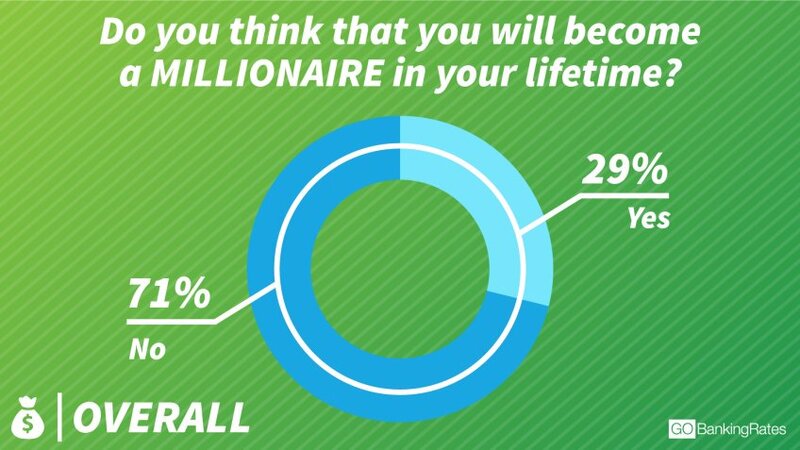 GOBankingRates surveyed 1,008 people and asked, "Do you think that you will become a millionaire during your lifetime?" Respondents could answer yes or no to the question. Here are the surprising results plus some helpful tips to realistically make your first $1 million. Napoleon Hill, author of the classic self-help book "Think and Grow Rich" once said, "Whatever the mind can conceive and believe, it can achieve." So how many Americans believe they have what it takes to become a millionaire in today's society? Most of the respondents to the GOBankingRates survey didn't believe it was likely. An overwhelming 71 percent answered no to the question of whether they felt having a net worth of a million bucks was in their future. Many Americans are achieving the dream, with people becoming millionaires at the rate of 1,700 every day, a trend expected to continue into the coming years. With more than 8 million millionaires in America today, the number will increase by an estimated 3.1 million by 2020. But at a time when there's a record number of millionaires being made, the middle class is also shrinking, and more than half of Americans will retire broke. According to Pew Research, middle class households decreased from 55 percent in 2000 to just 51 percent in 2014. Pew defines middle class as any household income between $37,146 and $111,550. Furthermore, the Federal Reserve Bank of St. Louis classifies roughly 75 percent of Americans as strugglers who make just enough to get by every year. The rest are thrivers who have the ability to save money, invest and accumulate wealth. The 2016 U.S. Trust Insights on Wealth and Worth Survey shows these thrivers commonly have a home environment where they learn everyday money skills even though they grew up in poor or middle class homes. The value of being a millionaire has also decreased. While the title sounds prestigious, you'd have to actually make $24.8 million to equal what a million bucks was worth back in 1913. 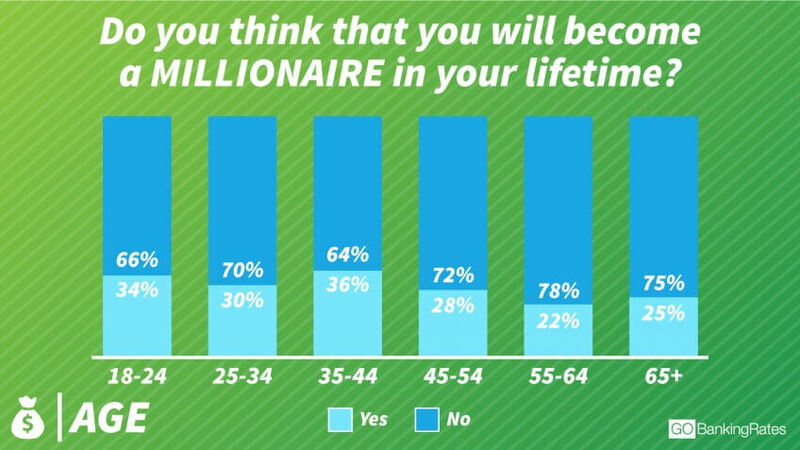 Respondents aged 35 to 44 had the most optimistic outlook on their chances of becoming a millionaire, with 36 percent believing that becoming a millionaire was within reach. Millennials aged 18 to 24 were also more optimistic than average, with 34 percent responding that they perceived becoming a millionaire as a possibility. Both groups are more likely to see using credit as a positive wealth-building strategy, according to the 2016 U.S. Trust Insights on Wealth and Worth Survey. Thirty six percent of Millennials and 34 percent of Gen Xers agree with the strategy and 92 percent of each group feel confident in their knowledge about how to strategically use it. While older generations believe more in saving and investing, their strategies over the years have paid off. In the GOBankingRates survey, 28 percent of those responding felt positively about reaching millionaire status. Twenty six percent of those age 65 and older felt the same. The best way to become a millionaire? Start early. A 20-year-old looking to save $1 million by retirement age only needs to save $305 a month. The older you get, the more you'll need to sock away. By 40, you'd need to set aside $1,466 per month. Up your game and find creative ways to earn more money to reach your goal faster. Not many decades ago, a woman's instruction on how to become a millionaire included grooming to find a rich husband. 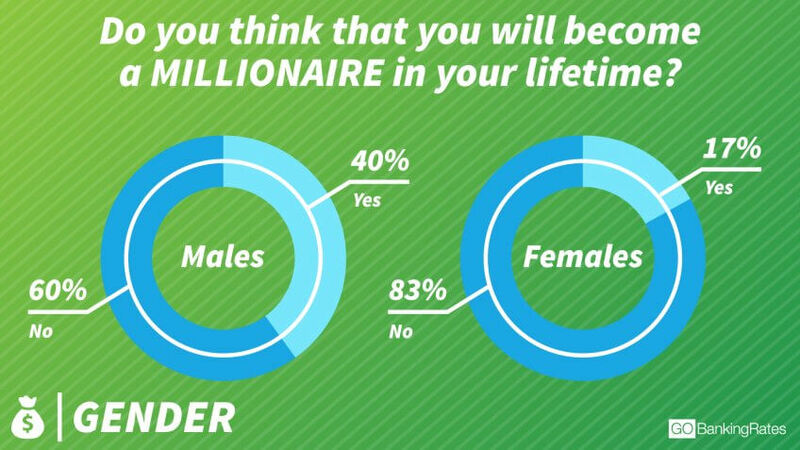 Today, more women are becoming millionaires themselves. According to a 2017 Forbes study, more women than ever now know how to be a millionaire without marrying up. They have become not just self-made millionaires, but billionaires. While women account for just 2.7 percent of all self-made billionaires worldwide, that number is more than double from just five years ago and up from 2.3 percent just last year. Women made up 40.6 percent of new entrepreneurs in 2016, according to an analysis by the Kauffman Foundation. While the figure is still lower than new male entrepreneurs, it's the greatest level of women entrepreneurship seen since 1996. With the dramatic rise in both entrepreneurship and self-made billionaire success, why are women so glum about their prospects of becoming a millionaire? Only 17 percent of female respondents to the GOBankingRates survey felt they had a reasonable chance of ringing the $1 million bell. Women are struggling to buy homes, too. Perhaps it's because women self-made millionaires are a fairly recent phenomenon. Madam C.J. Walker became the country's first in the early 1900s. As the child of black slave parents, a victim of sexual abuse and a young widowed mother, she had the deck stacked against her. When her hair began falling out, she experimented until she concocted a tonic that helped her scalp heal. She went from working as a wash woman to promoting her tonic as "Madam Walker's Wonderful Hair Grower." She died a millionaire in 1919. Her secret to success still holds true today. "I got my start by giving myself a start," she said. Respondents to the GOBankingRates survey didn't show a significant difference in their hopes of becoming a millionaire based on their region. Westerners felt slightly more hopeful about their prospects, with 33 percent of respondents feeling they might become a millionaire during their lifetime. 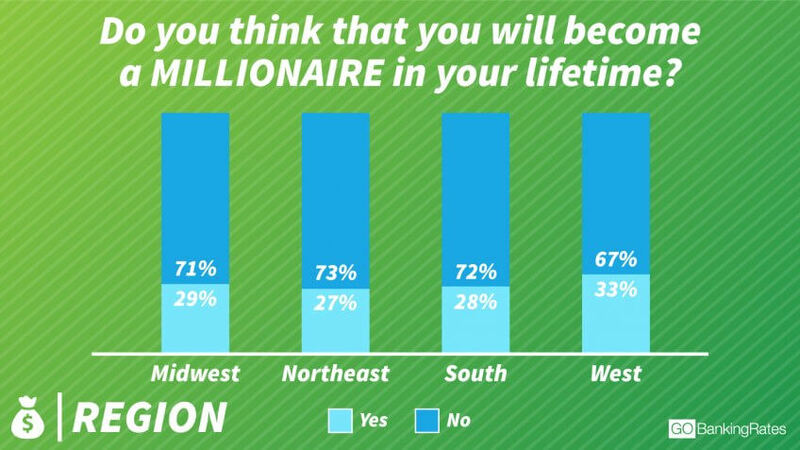 The least hopeful respondents were in the Northeast, where only 27 percent felt they could reach millionaire status. The Midwest and South had similar responses, with 29 percent and 28 percent responding affirmatively. Westerners' increased hopefulness is supported by statistics from the 2017 Phoenix Marketing International analysis of millionaire households. Utah and Arizona made up two of the four states reflecting the greatest millionaire growth, rising in the rankings by more than five places. Utah bumped its way up to No. 17 and Arizona to No. 30. Alaska and Hawaii top the western states as Nos. 4 and 5. The news wasn't all good for the west, though. New Mexico dropped 11 places due to its depressed oil and gas industry. The greatest concentration of millionaire households is still in the northeastern part of the country, where respondents in the GOBankingRates survey felt the least hope of achieving millionaire status. Maryland, Connecticut, and New Jersey topped the list. Maryland has held the top spot for millionaire population since 2011. So what does it take to turn millionaire wishes into reality? The answer might be easier than you might think. Curling up with a good book is one of the basics of how to be a millionaire. A 30-year survey of the world's wealthiest people by Steve Siebold, author of "How Rich People Think" found that self-made millionaires all have one thing in common. Reading is a significant part of their lives. Billionaires from Warren Buffett to Bill Gates to Mark Cuban all point to their voracious reading habits as a crucial part of their daily routine. But it's not just the act of reading itself, it's how you read and what you read. 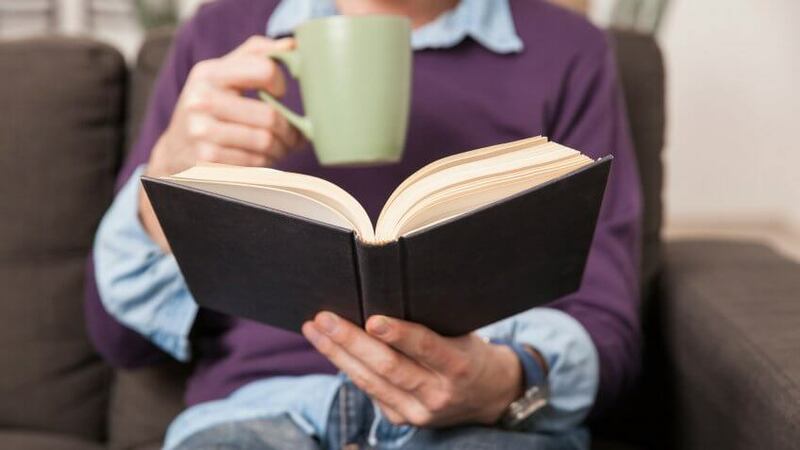 The reading habits of people with a liquid net worth of $3.2 million and an annual income of $160,000 or more do the bulk of their reading to educate and improve themselves, increasing their odds of success. Their reading material includes educational books rather than magazines or novels. Biographies and autobiographies of other successful people are also on the rich person's reading list as a source of inspiration and guidance. Warren Buffett's reading habits are legendary. He says his life forever changed after reading "The Intelligent Investor" by Benjamin Graham, which was first published in 1949. Today, Buffett devotes 80 percent of his workday to reading. If you think you can't find the time, try turning off the TV set. According to Tom Corley, author of "Rich Habits: The Daily Success Habits of Wealthy Individuals," 67 percent of wealthy people limit themselves to an hour or less of television daily. By comparison, only 23 percent of poor people turn off the tube after an hour. Methodology: The GOBankingRates survey asked 1,008 respondents, "Do you think that you will become a millionaire during your lifetime?" Respondents could select either "yes" or "no." Responses were collected through a Google Consumer Survey conducted April 26 - 28, 2017, and responses are representative of the U.S. online population. Becoming a millionaire is hard -- but not impossible. GOBankingRates > Making Money > Wealth > What Percent of Americans Think They Will Be a Millionaire?